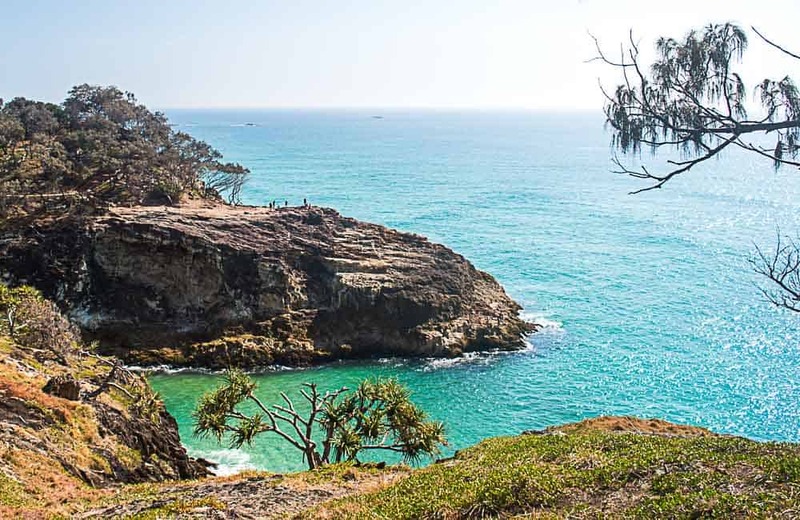 North Stradbroke Island, also known as Straddie or its traditional aboriginal name which is Minjerribah is a fantastic place to come for a few days or a few weeks to enjoy the natural beauty of the island. 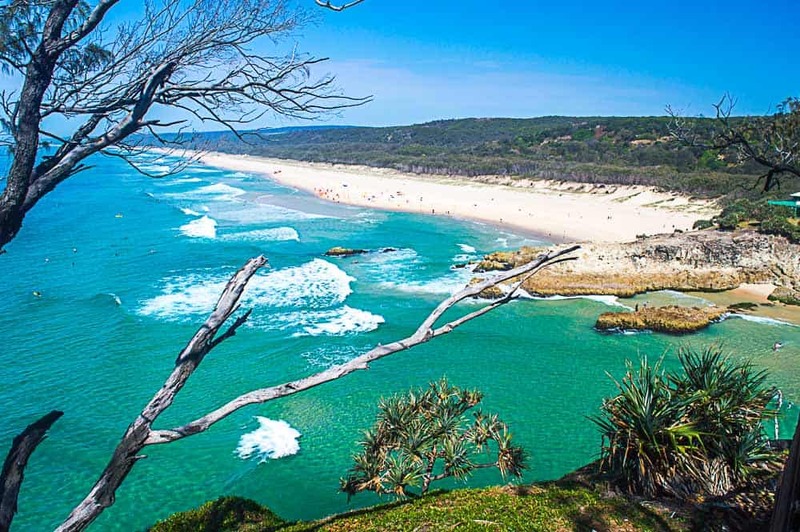 Stradbroke Island is the world’s second largest sand island, being 38 kilometres long and 11 kilometres wide and is located only 30 kilometres southeast of Brisbane. 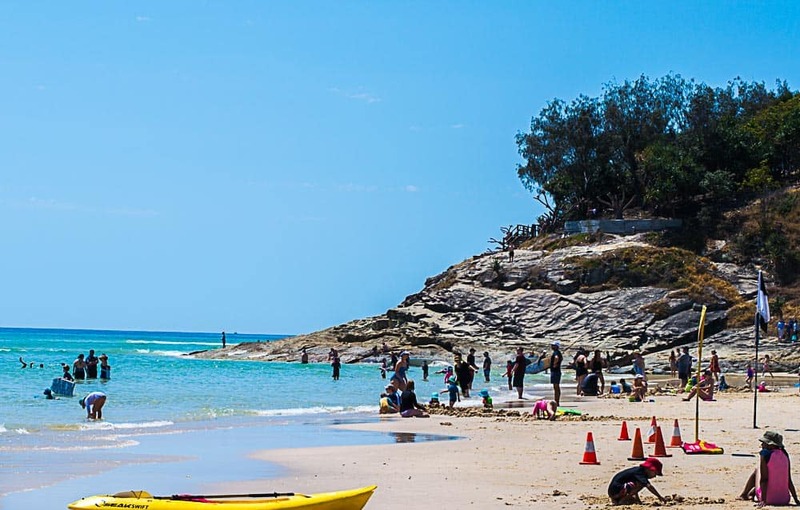 Your days on North Stradbroke Island holidays can be filled with swimming in the clear waters, exploring inland lakes, wildlife spotting or chilling back at one of the Stradbroke Island restaurants and cafes. 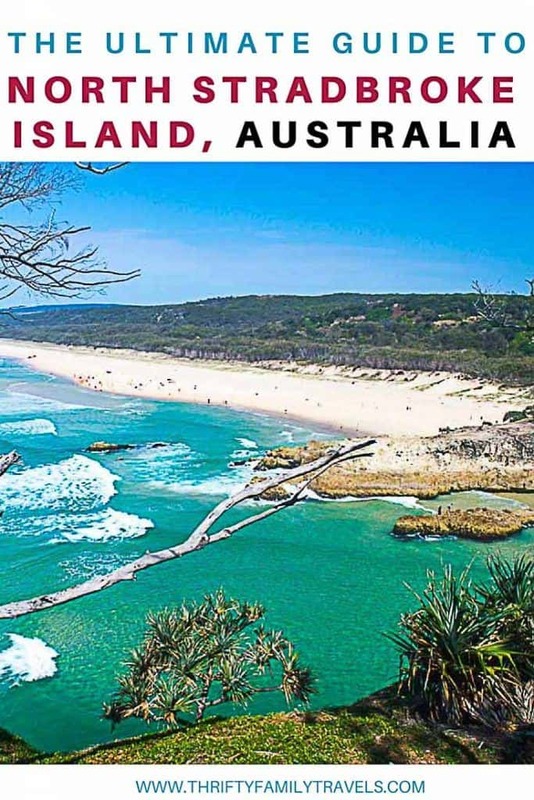 In this post we will cover of on everything you need to know for a trip to Straddie, including how to get there on the Stradbroke Island Ferry, tips for North Stradbroke Island Accommodation as well as Stradbroke Island camping and things to do. 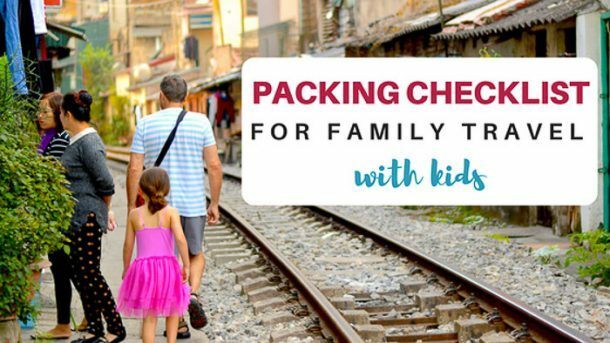 2.2 Download our FREE Printable Packing Checklist!! 2.3 We will email you a link to your FREE packing checklist. Many people come to North Stradbroke island to fish. 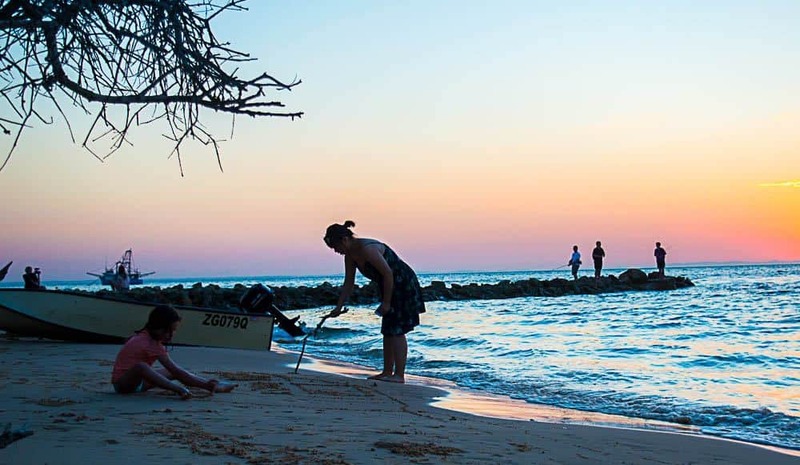 Beach fishing is popular from Flinders Beach and Main Beach, whilst the Rainbow Channel off shore from Amity Point makes it ideal for deep water fishing from the beach or jetty. There are also 2 public boat ramps from Amity Point and One Mile, Dunwich for launching boats. If you are a beginner but want to try your luck at beach fishing you can join a tour with Stradbroke 4WD Tours. They will supply you with everything you need for beach fishing and it is open to children of all ages. 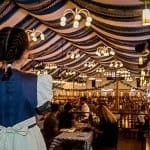 Prices start at $50 per adult and $35 per child. Between late May to early November, you can easily spot humpback whales from the land around Point Lookout and along the North Gorge Walk. Other places you may be able to spot them include Frenchman’s Beach and Cylinder Beach. Swim in Brown Lake or Lake Bummiera. This lake is a gorgeous lake perfect for families with little ones and an ideal spot for a picnic or BBQ lunch. Brown Lake Stradbroke Island is only a few kilometres from Dunwich. To reach Blue Lake, or Karboora you will need to walk the 5.2 km return circuit through the woodlands which takes approximately 2hours. Around the lake you can spot a variety of birds including honeyeaters, lorikeets, grebes and ducks. 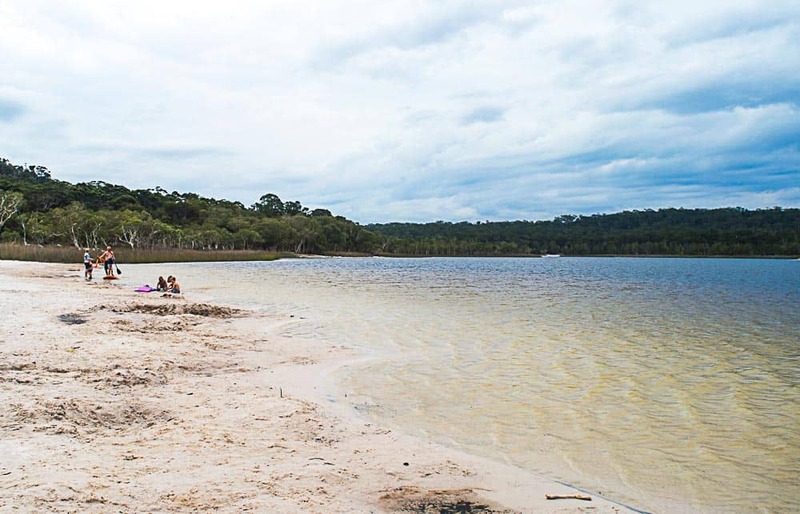 Karboora (Blue Lake Stradbroke Island) is a place of significant cultural value to the Quandamooka people and so swimming in the lake is not permitted. 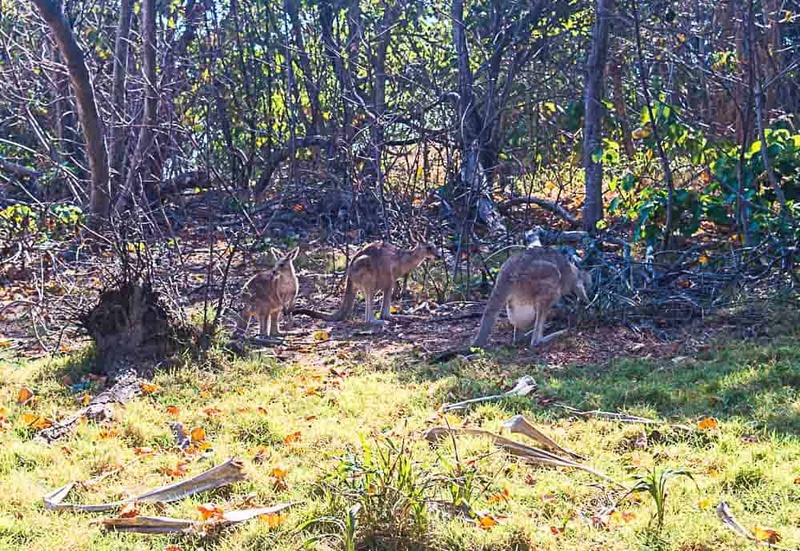 The Goompi Trail is an hour long guided walk along the foreshore of Dunwich where you will learn about Aboriginal artefacts, traditional hunting methods, bush tucker and more. 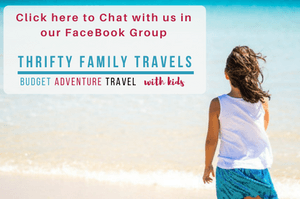 If you love beach holidays – have you considered Caloundra? Caloundra is only 1 hour north of Brisbane and is a fantastic location for a family holiday. 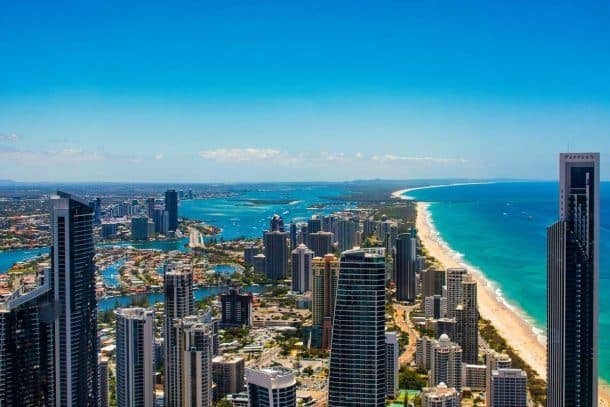 Check out our Caloundra guide here. Located in Dunwich you can check out local Aboriginal art at the Salt Water Murri Gallery. For history buffs you may enjoy wandering around the historical cemetery at Dunwich where you can find graves dating back to 1847. There are over 8500 unmarked graves from the inmates from the Dunwich Benevolent Asylum as well as graves from the typhus epidemic in 1850. Everyone coming to North Stradbroke Island must check out the North Gorge Walk. This is an easy 1.5 km walk providing spectacular views from the rocky outcrops across the Pacific Ocean. 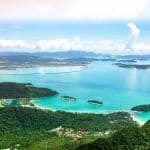 From the designated walk ways, you can easily spot dolphins, turtles and manta rays as well as whales during the months of June to November. Along the path you most likely will see kangaroos grazing as well. The walk commences at Point Lookout opposite Fish Café and takes around 1 hour at a slow leisurely pace. The walk can be strenuous at times due to steep stairs, but for the most part it is an easy walk and suitable for all fitness levels and ages. There are parts of the walk that allow you to walk out on the rocks along the cliffs, provided you keep a safe distance from the edge this is safe enough, however keep a close eye on younger children. At the end of the walk there is toilets and a small playground. On a hot day reward yourself with some delicious ice cream from the Oceanic Gelati Bar which is located in the small group of shops at Point Lookout. Popular surfing spots on North Stradbroke Island include Main Beach and Cylinder Beach. If you are new to surfing but want to give it a go you can hook up with the North Stradbroke Island Surf School. If you have your own permit you can take your 4WD on the designated beach and bush tracks. Alternatively, you can join half and full day tours with Stradbroke 4WD Tours or Straddie King Fisher Tours. As well getting you off road in a 4WD these tours take you to some of the best parts of the island and so are ideal if you don’t have your own transport. Heading to Brisbane? Get our full Brisbane Guide here. 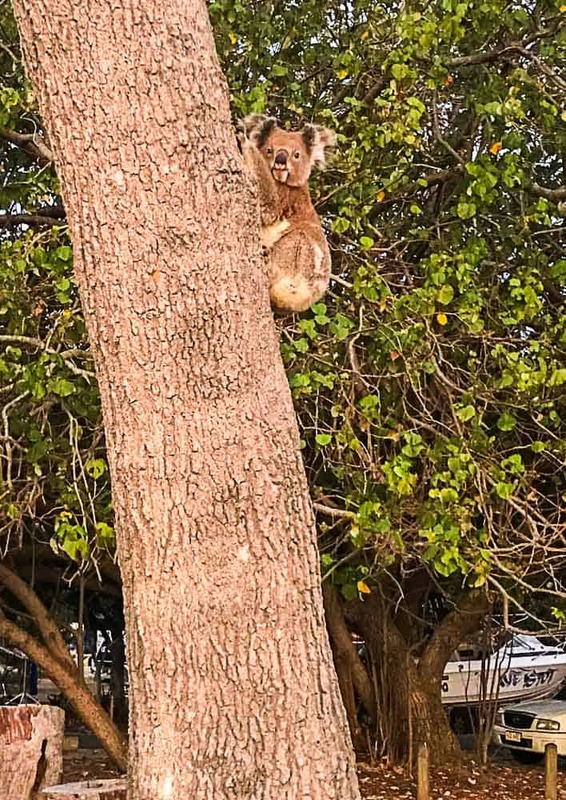 North Stradbroke Island is a great place for spotting animals in the wild – both on land and in the ocean. From the shore at Amity Point you can see dolphins and pelicans, whilst around the Amity Point camp grounds you can see koalas and ducks. Around the North Gorge walk you can spot manta rays, dolphins, turtles and whales in the ocean whilst on the land you will see kangaroos. For even better wild life spotting, bring along a pair of good quality binoculars. Golf lovers can play a round of golf at North Stradbroke Island Golf Club or take the family for a game of putt putt. Visitors can come and play bare foot bowls as well has have a few drinks and lunch or dinner at the Point Lookout Bowls Club. Either bring your own kayak, hire one or join a kayaking tour and explore the crystal-clear waters of Moreton Bay. You can spot marine life such as fish, turtles, stingrays, starfish and dolphins. Both Straddie Kingfisher Tours and Straddie Adventure provide various kayaking tours from $60 per adult and $45 per child. 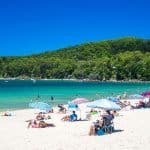 There are numerous different beaches to chose from on North Stradbroke Island such as Amity Point, Flinders Beach, Clyinder Beach, Deadman Beach and Main Beach just to name a few. During our recent trip to North Stradbroke Island we swam in both Amity Point and Cylinder Beach – both ideal for families. 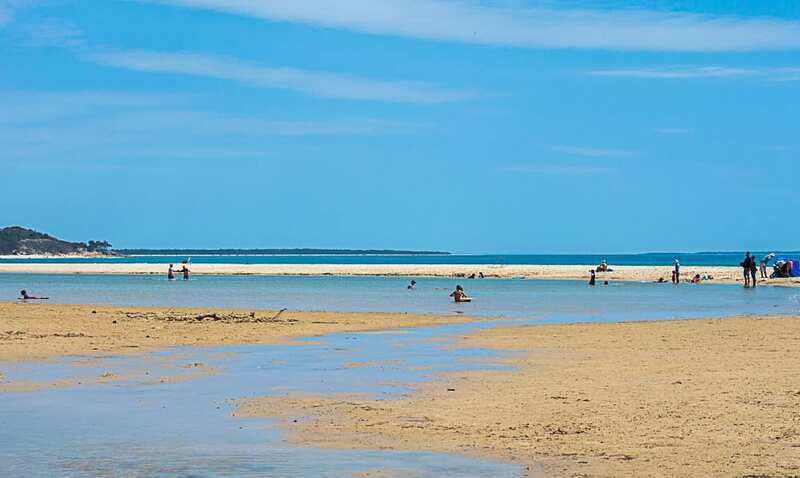 Amity Point is completely flat whereas Cylinder Beach has soft waves and also at low tide it has 2 lagoons which are fantastic for kids to swim in. Every second Sunday from 8 am to midday the Point Lookout Markets are held where you can purchase arts and crafts as well as local produce. The markets are located at the Point Lookout Community Hall on East Coast Road. Explore the various displays about the Quandamooka people, convict history, shipwrecks and maritime history. The museum is located in Dunwich and is open daily. 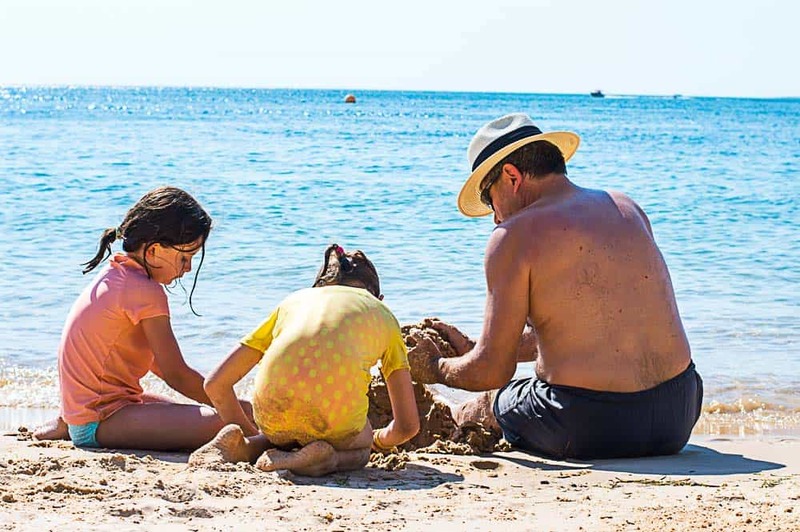 Of course what family beach destination holiday is complete without building sand castles on the beach. As well as sandcastles we spent time digging massive big holes, beach walls, burying each other as well as creating mermaid tails. Have a go at sandboarding down Straddie’s giant sand dunes. Straddie Adventures or Straddie King Fisher Tours will supply you with everything you need as well as help you master all the techniques. Prices start at $35 per adult and $30 per child. The rock wall at our camp at Amity Point, is home to numerous crabs and sea snails. The kids (including Andy) were fascinated with watching these little guys dart in and out of the rocks as well as catching a few for a closer look. The rocks are of course can be dangerous and it is a good idea to ensure everyone has shoes on when climbing over them as one little guy in our group cut his foot quite badly on the rocks. You can dive or snorkel among the rays and turtles off Point Lookout with Manta Lodge and scuba centre. Snorkeling starts at $90 per person and diving from $140 per person. If you want to do your own snorkeling popular spots are the Rock Walls at Amity, the reefs at Deadman’s Beach, Point Lookout and South Gorge, Point Lookout. There is plenty of calm water around North Stradbroke which is ideal for stand up paddle boarding. Whether you bring your own, hire one of join a lesson you will love exploring Moreton Bay’s clear waters as well as spotting various marine life. Straddie Stand Up Paddle offers lessons and on occasion hires out equipment from Flinders Beach. Join in a yoga class with Straddie’s resident yoga teacher Jackie. She runs yoga classes on Mondays, Tuesdays and Thursdays. During school holidays she runs sunrise classes at the Gorge Headland. There are a range of North Stradbroke accommodation options from hotels, resorts, holiday rentals, B & B’s and camping. You will find Straddie accommodation available in the 3 different townships being Dunwich, Point Lookout and Amity Point. Point Lookout is where you will find most of the Stradbroke Island accommodation. The area is a popular choice for its surf beaches, land based whale watching, stunning views from the North Gorge walk, shops and restaurants. 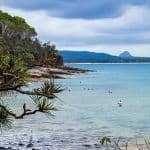 Point Lookout is a large area and encompasses various smaller areas such as Adder Rock, Home Beach, Cylinder Beach, Deadman’s Beach, Frenchman’s Bay and Main Beach. 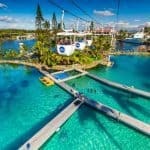 My pick out of all the beaches for families is Cylinder Beach. I love when the tide is out how it creates two seperate lagoon type pools which are perfect for small children. Resort facilities include a swimming pool, restaurant, sauna, BBQs. Check here for availability and the best price for the Anchorage on Straddie Beachfront Island Resort. 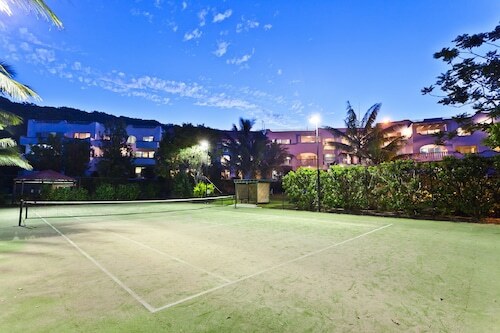 Check here for availability and the best price for the Allure Stradbroke Resort. Check here for availability and the best price for the Islander Holiday Resort. Check here for availability and the best price for the Cylinder Cove Apartments. Check here for various other holiday rentals in Point Lookout. You can also check out Airbnb for private holiday rentals. If you are new to Airbnb click here to receive a $50 AUD off your first booking. 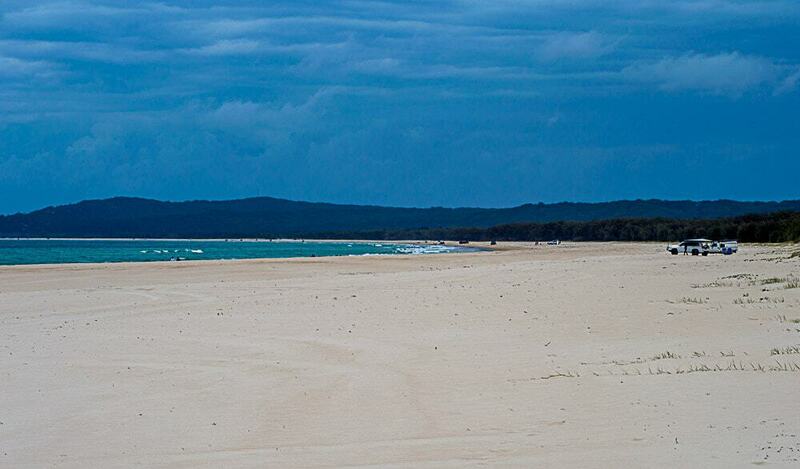 There are 4 different camp grounds within Point Lookout being Adder Rock, Home Beach, Cylinder Beach and Main Beach. Close by is a general store, Manta Lodge Scuba Centre and the Point Lookout Bowls Club. Click here for more information about camping at Adder Rock or to make a booking. Close by is a general store, cafes and the Point Lookout Bowls Club. Click here for more information about camping at Home Beach or to make a booking. Close by are cafes, shops, Point Lookout restaurants and the Stradbroke Island Beach Hotel. Click here for more information about camping at Cylinder Beach or to make a booking. This camp site is located at the southern end of Main Beach Stradbroke Island, which is located along the eastern side of the island. This is an ideal location for those wanting to surf or beach fish. Access is only by 4WD and so a permit is required and the beach is dog friendly. All camp sites are unpowered and there are no facilities. Campers can purchase an access pass for $10 per night per camp site to use the facilities at Adder Rock campsite. Amity Point is a small seaside village with calm water and great place for dolphins and pelican spotting. This is an ideal spot for families as it is relatively quiet and the calm waters are perfect for kids to swim in. The township of Amity Point includes a general store, newsagent, café, seafood store, playground, and sports club all within walking distance of each other. Check here for availability and the best price for the Sea Shanties. For Stradbroke Island holiday rentals in Amity Point, check out websites such as Stayz or local rental companies like Straddie Sales & Rentals. You can also check out Airbnb Stradbroke Island for private holiday rentals. If you are new to Airbnb click here to receive a $50 AUD off your first booking. Located on the calm waters of Moreton Bay, Amity Point is ideal for families, particularly families with small children. Guests regularly spot various wildlife around the grounds including dolphins, pelicans, crabs, ducks and koalas. Amity Point is perfect for those wanting to kayak, stand up paddle boarding or fish. This Amity Point caravan park facilities include BBQ facilities, sinks, toilets, showers, picnic tables, laundry and playgrounds. Within walking distance from this North Stradbroke camping spot is a general store, newsagent, café, seafood store, playground, and sports club. We stayed at Amity Point camp grounds during our recent visit and can highly recommend it. I would recommend getting a camp site in front of the beach area. My other recommendation is to ensure you bring and wear lots of bug spray. The sand flies are fierce here and if you are like me and prone to being eaten you will definitely need to a good quality repellent. Click here for more information about camping at Amity Point or to make a booking. All camp sites are unpowered and the only facilities are a few toilets at a few access points. Campers can purchase an access pass for $10 per night per camp site to use the facilities at Adder Rock campsite. 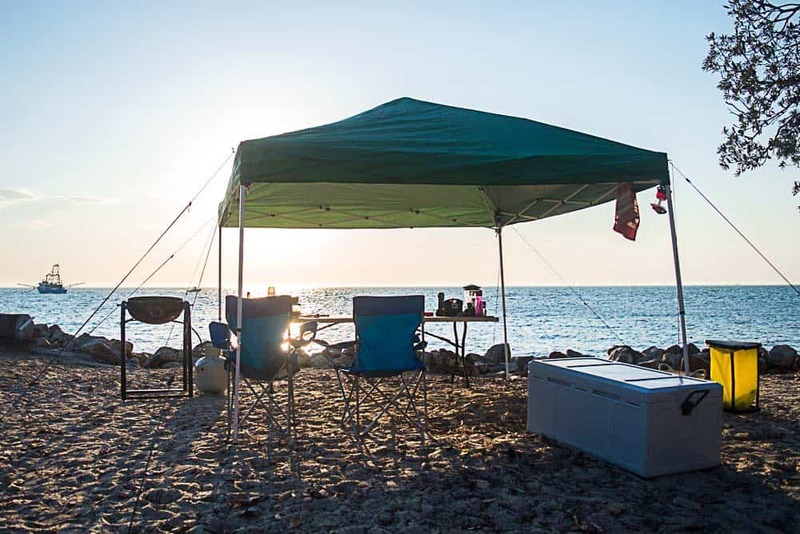 Click here for more information about camping at Flinders Beach or to make a booking. Dunwich is the gateway to the island by ferry or water taxi and has a range of cafes, shops and services including 2 mini supermarkets, butcher and baker. There isn’t a North Stradbroke island hotel in Dunwich, the main accommodation option is the camp grounds. However you can check out websites such as Stayz or local rental companies like Straddie Sales & Rentals. You can also check out Airbnb Stradbroke Island for private holiday rentals. If you are new to Airbnb click here to receive a $50 AUD off your first booking. Adams Beach is close to Dunwich Cemetery, Little Ship Club, North Stradbroke Island Museum and Aboriginal Art Galleries, RSL and golf course. Click here for more information about camping at Adams Beach or to make a booking. Click here for more information about camping at Bradbury’s Beach or to make a booking. 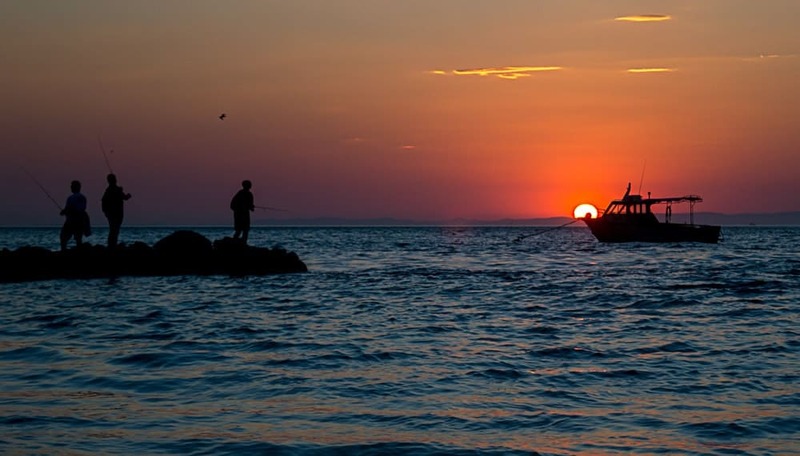 From Brisbane to Stradbroke Island, you will need to go via the vehicle ferry or water taxi. as there is no road from the mainland to North Stradbroke Island. The Stradbroke Island car ferry departs from Toondah Harbour which is located in Middle Street, Cleveland. Prices for the North Stradbroke Island ferry start at $55 per vehicle one way. Vehicles over 6 metres long and trailers cost extra. You are required to arrive at least 20 minutes before your departure time for check in. Once you are on the Straddie barge and on your way you are free to move around the barge. There is a café on board selling drinks and snacks. The trip takes around 45 minutes each way. There are 12 North Stradbroke ferry departure times from both Cleveland and Dunwich each day with additional services on Fridays and Sundays. Departures on the Straddie Ferry book out fast and so it is highly recommended that you book your ferry as soon as you make your accommodation booking. 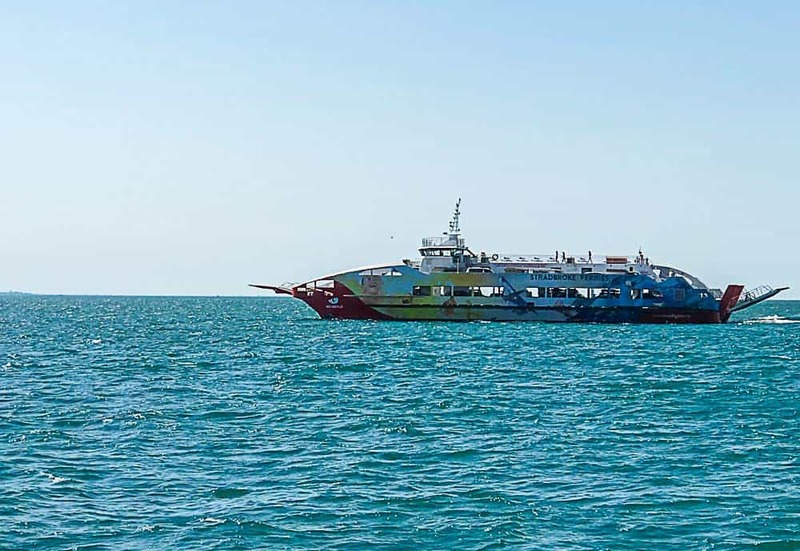 Check the Stradbroke Island ferry timetable and make your booking here. It is also possible to go on the vehicle ferry without a car. A return ticket is $10 per adult or $5 per child. There are two water taxis – Stradbroke Ferries or Stradbroke Flyer. The Stradbroke Ferries operate from 3 Emmett Drive Cleveland and arrives on the island at the Harold Walker Jetty in Dunwich. There are around 14 services daily with the trip time taking 25 minutes – see the timetable here. One way tickets are $10 per adult and $5 per child. There is no need to make advance bookings. The Stradbroke Flyer departs from the end of Middle Street, Cleveland and travels to One Mile Jetty at Dunwich. There is a free shuttle from the Cleveland train Station and the Cleveland’s Central Shopping District to each departure. There are around 14 services daily with the trip time taking 25 minutes – see the timetable here. One way tickets are $10 per adult and $5 per child. There is no need to make advance bookings. 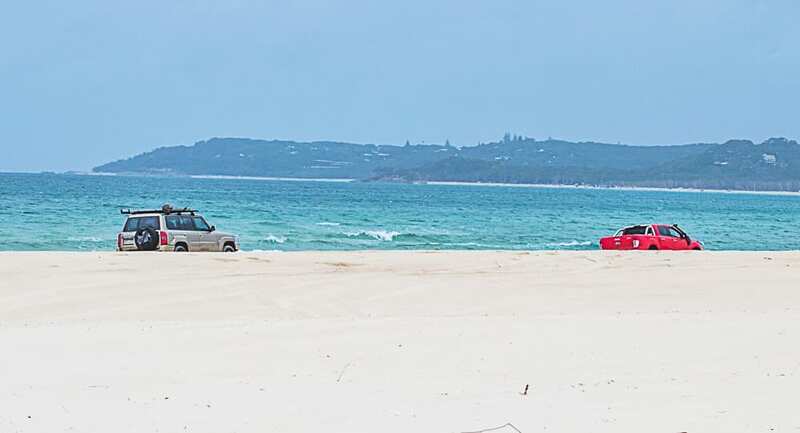 North Stradbroke Island is a fairly large island and so the easiest way to get around Island is by car. If you intend to go off road along the beach or on some of the bush tracks you will require a 4WD and a 4WD permit. 4WDs are only permitted Flinders Beach and Main Beach at the designated access points. Permits are $45.25 for an annual pass. Purchase your 4WD permit here. If you don’t have a car it is possible to get around the island by bus. The local bus meets the water taxi service and goes to Dunwich, Amity Point and then Point Look Out. Check the current timetable here. Other options of getting around include taxi or cycling. 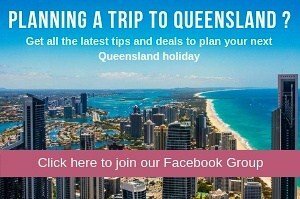 Are you visiting Queensland and looking for tips on where to go? Click here for more tips on where to go with the kids in Queensland. The above posts contain affiliate links which means that if you book accommodation through any of the links I will receive a small commission. This enables me to continue to bring this information completely free to you. Thanks for supporting our website. Want to keep this handy for later?